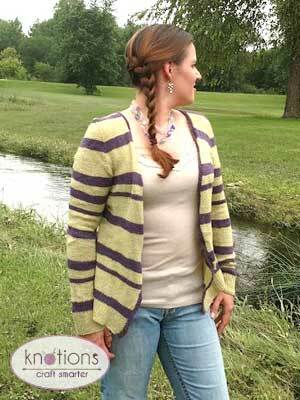 This light weight cardigan is great for those Spring days where the weather can change rapidly. A cool brisk morning gives way to the hot afternoon before dropping back down again. Take this cardigan on and off as the weather dictates and be ready for anything – a restaurant with too-chilly air conditioning, the warmth of the afternoon sun, or the chill that comes over things once the sun goes down. Knit Picks Gloss Lace (70% Merino, 30% silk; 440 yards / [50 g]): MC: Celery, 2 (2, 3, 3, 3, 3) skeins; CC: Merlot, 1 (1, 1, 1, 2, 2). 28 sts and 38 rows = 4” [10 cm] in St st after wet blocking. Piece is worked seamlessly to the underarms; circular needle is used to accommodate the large number of stitches. With MC using Backwards Loop Method CO 197 (229, 249, 277, 305, 349) sts. Start working Striping Pattern in 1×1 rib for 3” [7.5 cm]. Work 1” [2.5 cm] in St st, ending on a RS row. Set-Up Row (WS): P46 (54, 59, 66, 73, 84), pm, p105 (121, 131, 145, 159, 181) pm, purl to end. Dec Row (RS): *Knit to 3 sts before m, ssk, k1, sl m, k1, k2tog; rep from * once more, knit to end—4 sts dec’d. Rep Dec Row every 6th row 7 (7, 7, 7, 6, 6) times—165 (197, 217, 245, 277, 321) sts rem; 38 (46, 51, 58, 66, 77) front sts; 89 (105, 115, 129, 145, 167) back sts. Work evenly until piece measures 10 (10, 10, 10, 11, 11.5)” [25.5, 25.5, 25.5, 25.5, 28, 29.25 cm] from CO edge, ending on a WS Row. Inc Row (RS): *Knit to 1 st before m, rli, sl m, k1, lli; rep from * once more, knit to end—2 sts inc’d. Rep Inc Row every 6th row 5 (5, 6, 6, 6, 6) more times—189 (221, 245, 273, 305, 349) sts total; 44 (52, 58, 65, 73, 84) front sts; 101 (117, 129, 143, 159, 181) back sts. Work 1 WS row even. With MC, CO 44 (48, 52, 56, 64, 72). DO NOT JOIN. Row 1 *K1, p1* across. Divide sts between DPNs, place m to indicate start of rnd and join for working in the round. This is the first rnd of the striping patterns for the sleeves. Work rib for 4” [11.5 cm] and cont working the striping pattern. Knit 1 rnd. Inc Rnd K1, Lli, knit to 1 sts before end of rnd, rli. Rep Inc Rnd every 9 (9, 9, 9, 8, 7) rnds 11 (11, 12, 13, 14, 17) more times—68 (72, 78, 84, 94, 108) sleeve sts total. Remember to switch colors as needed for the striping pattern. Work evenly until striping pattern is one row less than the body at this point. 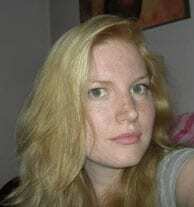 The sleeve should measure approx 16 ½ (17, 17, 17 ½, 17 ½, 18)”. Next rnd K5 (6, 6, 7, 8, 9) sts, break yarn leaving a long tail for grafting. Rm, place first and last 5 (6, 6, 7, 8, 9) sts of rnd on holder for underarm—58 (60, 66, 70, 78, 90) sleeve sts rem. Neck Shaping continues through Armhole Shaping. 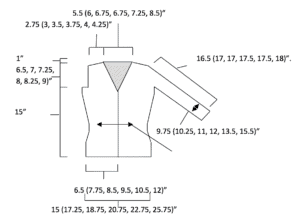 The first 4 rows are worked on the body only, and then you’ll add the sleeves on the joining row. Remember to continue working the striping pattern through this entire section. 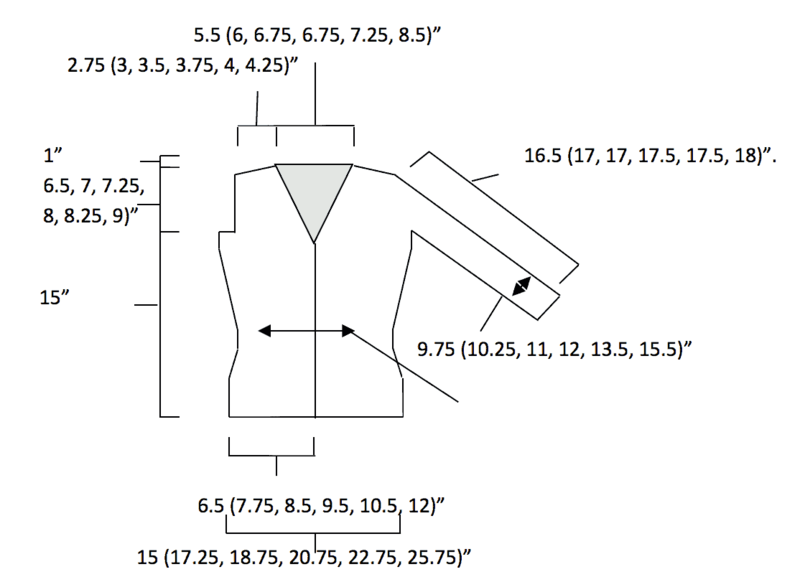 Neck Shaping Row (RS): K1, ssk, knit to 3 sts from end, k2tog, k1—2 sts dec’d. Work 3 rows even. Joining Row (RS): K1, ssk, k35 (42, 48, 54, 61, 71) sts, place next 10 (12, 12, 14, 16, 18) sts on holder for underarm (half will be from the front and half will be from the sleeve), pm, k58 (60, 66, 70, 78, 90) sleeve sts, pm, place next 10 (12, 12, 14, 16, 18) sts on holder for underarm (half will be from the sleeve and half will be from the back), k91 (105, 117, 129, 143, 163) back sts, place next 10 (12, 12, 14, 16, 18) sts on holder for underarm (half will be from the back and half will be from the sleeve), pm, k58 (60, 66, 70, 78, 90) sleeve sts, pm, place next 10 (12, 12, 14, 16, 18) sts on holder for underarm (half will be from the sleeve and half will be from the front), knit to 3 sts from end k2tog k1—281 (311, 347, 379, 423, 487) sts total. Work 1 WS row even. Rep Neck Shaping Row every 4th row 9 (11, 13, 13, 15, 19) more times—20 (21, 25, 27, 28, 30) front sts remain after all shaping. At the same time work armhole shaping and then sleeve caps. Shape armholes Dec Row (RS) *Knit to 3 sts before sleeve m, k3tog, sl m, knit to m, sl m, sssk; rep from * once more, knit to end—8 sts dec’d. Rep Dec row every RS row 1 (2, 2, 3, 3, 6) more time(s), ending on a WS Row—4 (6, 6, 8, 8, 14) sts dec’d from each side of armholes. Once the armholes have been shaped, begin working the Sleeve cap decs (below). Shape sleeve cap Dec Row (RS) *Work in patt to m, sl m, ssk, knit to 2 sts before m, k2tog, sl m; rep from * 1 more time, work in patt to end—2 sts dec’d from each sleeve, 4 sts dec’d in total. Rep Dec Row 4th row 4 (4, 3, 3, 1, 0) more times. Work 1 WS row. Next row (RS): Rep Dec Row every RS row 18 (18, 20, 20, 21, 25) times. End having just worked a RS row. Next Row (WS): *Work in patt to sleeve m, sl m, p2tog, purl to 2 sts before m, ssp, sl m; rep from * once more, work to end—2 sts dec’d from each sleeve, 4 sts dec’d in total. Rep Dec row every row (both RS and WS rows) 2 (2, 4, 6, 10, 16) more times—8 sts rem. Keep in mind that you’ll be doing dec’s on both RS and WS rows at this point so you’ll need to work both of them. Next row (RS): Knit to first sleeve m, sl m, ssk and sl st to left needle, turn—1 st dec’d. Next row (WS): Purl to end. Rep last 2 rows 3 more times—4 sleeve sts remain. Next row (RS): Work in patt to left sleeve m, sl m, ssk and sl st to left needle—1 st dec’d on left sleeve. Next row (WS): Work in patt to next sleeve m, sl m, p2tog and sl st to left needle—1 st dec’d on right sleeve. Rep last 2 rows 2 more times—1 right sleeve st remains; 5 left sleeve sts remain. Next row (RS): Work in patt to end. Next row (WS) Work in patt to first sleeve m, sl m, p2tog and sl st to left needle, turn—1 sts dec’d. Next row (RS) Work in patt to end. Rep last 2 rows 3 more times—1 left sleeve st remains. Next row (WS) Work in patt to 1 st before first sleeve m, p2tog removing m, sl m, work in patt to 1 st before next sleeve m, ssp removing m, sl m, work to end. Join shoulders: Next row (RS) Break yarn leaving a long tail, place 22 (25, 28, 32, 33, 33) right front sts on dpn, then place 22 (25, 28, 32, 33, 33) back sts on another dpn. Using 3 needle bind off, join shoulders. Rejoin yarn and knit 44 (46, 48, 48, 52, 56) sts across back neck, break yarn leaving long tail. Place 22 (25, 28, 32, 33, 33) back sts on dpn, then place 22 (25, 28, 32, 33, 33) left front sts on another dpn. Using 3 needle bind off, join shoulders. Next row (WS) Rejoin yarn, purl to end, place sts on holder or scrap yarn. 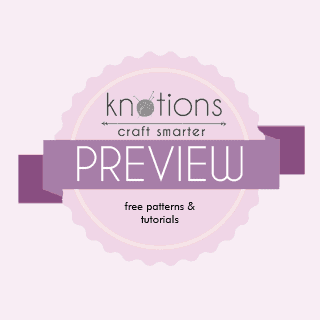 Using CC only, with RS facing, pick up and knit 3 sts for every 4 rows, making sure to pick up an even number of sts, carefully return neck sts to needle and knit, pick up and knit the same number of sts down the left side. Work 1×1 rib for 1”. Bind off in pattern. Can this very flattering, sophisticated cardigan be knitted more quickly please? Can it be done on larger needles with aran or maybe chunky yarn? The thought of doing so many stitches in one go is beyond me. I can keep this for future reference. This print is rather pale and small so please excuse typos. I’m sorry – it’s only designed for this weight of yarn. 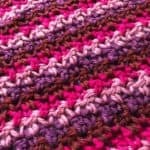 If you want to convert it you might be able to by replacing the yarn with a heavier weight yarn and working a smaller size. You’ll need to make sure the lengths are correct along the way as well so make sure you look at that as well. 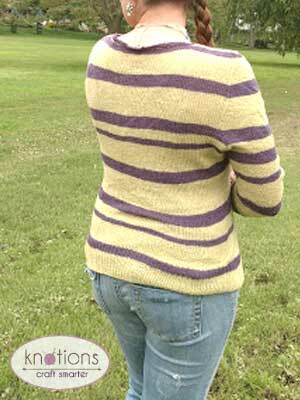 I love this pattern and had the right yarn for it – except that it is a variegated yarn so I am not doing the stripes. I am quite an experienced knitter although I hadn’t knitted for years and have only taken it up again in the last year. My projects so far have been fairly easy, so I thought I was ready for a challenge! For my convenience, I am going to quote in my size ie the 2nd size. 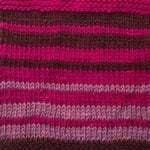 I have knitted up the body and the sleeves and am now up to the Joining Row ie of sleeves and body – in your pattern it is in the Yoke section – Joining Row that I am having a lot of difficulty. “place next 12 sts on holder for underarm (half will be from the front and half will be from the sleeve)” . Do you mean put the next 12 sts from the Front onto the holder? 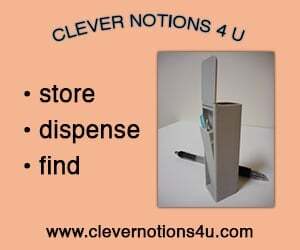 So there will be 24 sts on the holder – from the Sleeve and from the Front? I then knit the 60 sts from the sleeve. Then “place next 10 (12, 12, 14, 16, 18) sts on holder for underarm (half will be from the sleeve and half will be from the back),” Once again, I don’t understand this. By the end of the Joining Row, should I have any stitches on the holders? And when I do the maths, it doesn’t add up for me. I have not had any problems with the pattern up till this point. But from here on, it does seem to get a bit more complicated. I hope, once I get your help with the Joining Row, that I should be OK with the rest. Thanks in advance for your help. 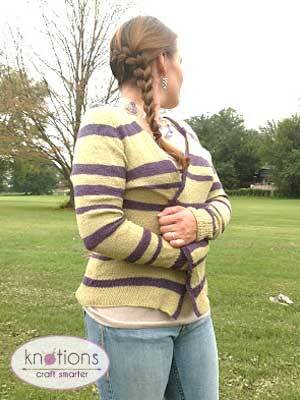 As I mentioned, I love this cardigan, and especially that it is knit in one piece! (RS): K1, ssk, k42 sts, place next 12 sts on holder for underarm (half will be from the front and half will be from the sleeve), pm, k60 sleeve sts, pm, place next 12 sts on holder for underarm (half will be from the sleeve and half will be from the back), k105 back sts, place next 12 sts on holder for underarm (half will be from the back and half will be from the sleeve), pm, k60 sleeve sts, pm, place next 12 sts on holder for underarm (half will be from the sleeve and half will be from the front), knit to 3 sts from end k2tog k1—311 sts total. Work 1 WS row even. 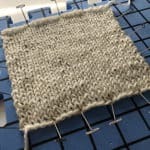 I am guessing that I need to be adding additional stitches onto my sleeve stitch Holders – so each stitch holder will have 24 stitches. And, unless my maths is wrong, I end up with 313 stitches. 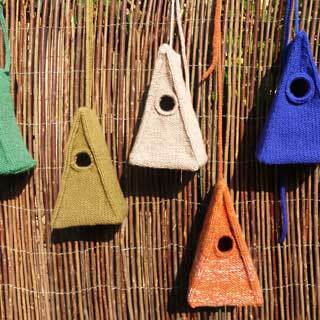 And I can’t figure out what to do with the stitches on the Holders? They don’t seem to be referred to in the rest of the pattern. Any enlightenment would be great, thanks! I get 313 when I looked at it again. I think I have an error in my formula on my spreadsheet. I truly apologize for this. I’m going to email Alexis (the designer) now to confirm. So for now, I’m not going to change the pattern, but I’ll reply back here once I do. Sleeve stitch holders should be 14 total for each sleeve, for a TOTAL of 48 sts. You mentioned this confused you, so let’s try to state it a different way! Starting with the front, you K1, ssk, k42. At this point you will have 6 sts left to go on the front. Take those 6 sts and put them on a holder. Then, take the next 6 sts (these will be from the sleeve) and put them on the same holder. Then knit the sleeve until 6 sts rem. Take those 6 sts, and 6 sts from the back and put all 12 of those sts on a holder. Now, do the same thing for the second sleeve. BTW, this is a challenging row so don’t despair!